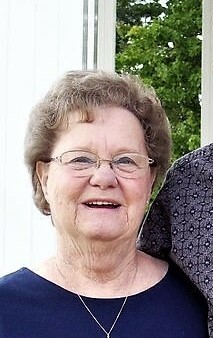 Helen J. Hollis, age 79 of Edwardsburg, Michigan went to be with the Lord on Monday, December 3, 2018. Helen was born January 7, 1939 in Paducah, Kentucky to the late Walter L. and Beulah Rose (Matthews) Barnes. On September 26, 1958, she married Bill Hollis in Cairo, Illinois. Surviving is her husband of 60 years, Bill Hollis of Edwardsburg, and their daughter Kim (Jon) Silveus of Granger. Also surviving are her grandchildren, Joshua Silveus, Jason Silveus, and Crystal (Brandon) Pannabecker, and her great grandchildren Kyle and Emma. Surviving as well is her brother Gary (Kim) Barnes of Niles, Michigan. She was preceded in death by her parents and her brother Walter L. “Buddy” Barnes Jr.
Visitation will be held from 5:00 -8:00 pm Thursday, December 6, 2018 at Cruz Family Funeral Home in Osceola. There will also be one hour of visitation prior to the 11:00 am funeral service on Friday, December 7, 2018 at the Cedar Road Missionary Church 56907 Cedar Road, Osceola, Indiana. Interment will follow in Chapel Hill Memorial Gardens, Osceola. Helen was employed for over 30 years with Simplicity Pattern of Niles. In her spare time, she enjoyed crocheting, and camping with her family. Helen was also a longtime member of the Cedar Road Missionary Church. In her memory, donations may be made to the Alzheimer’s Association. To leave an online condolence or light a virtual candle in her memory, please follow the links provided in the "Tribute Wall" tab above.